I feel like I'm in summer mode today... That's code for I really don't feel like getting much done and would rather laze about reading. Unfortunately that's not what's on the schedule and I'm forced to adult. But, today's schedule does include a skincare chat, so not all is lost. Today's edition of The Fast Five finds us at Sephora with five skincare picks you can add to your next haul. Ready? Read on! 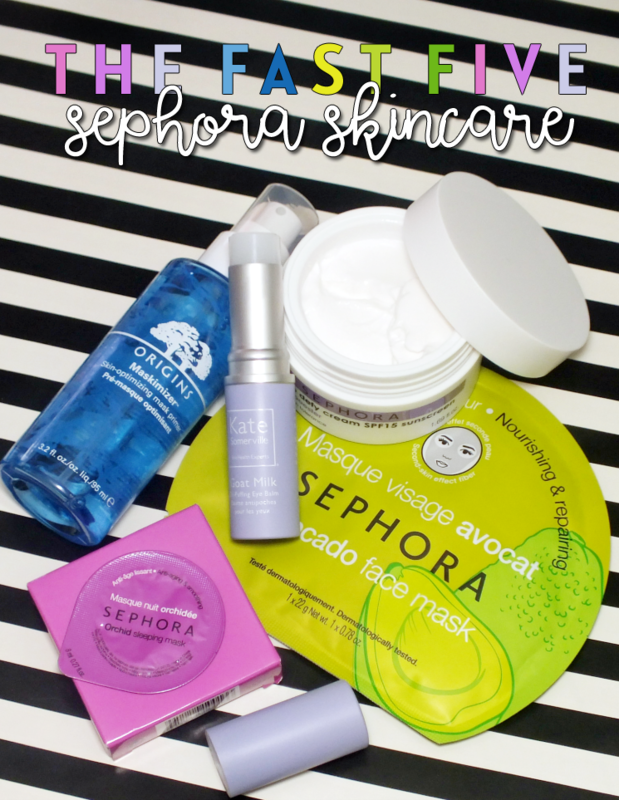 Clearly, Sephora's own Sephora Collection is a good place to start your skincare journey. The range is pretty extensive and offers quality products at reasonable prices. If you're like me and have yet to meet a mask you didn't love, then the Facial Mask and Sleeping Masks will warm your skincare loving heart. Both the sheet masks and overnight masks come in a host of varieties (like avocado, orchid, rose, pomegranate, green tea...) with each main active ingredient offering different skincare benefits. The Face Masks are made of natural fibre, and are very well saturated. 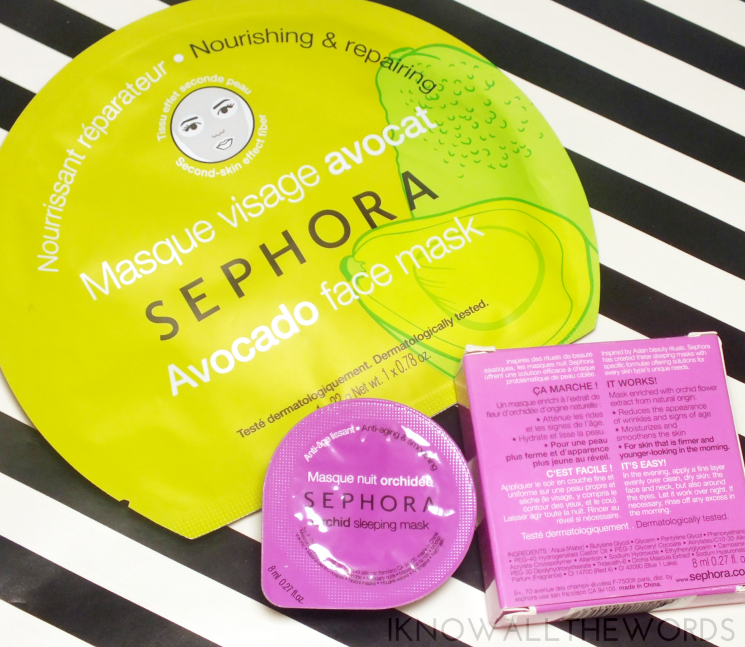 The Avocado mask is "nourishing & repairing" by providing intense hydration and relieving sensitive areas. I used this after a deep cleansing clay mask, and love that it added so much moisture back into my skin. It's a cheap thrill you're going to want to stock up on. The Sleeping Masks are offered in the same selection as the Face Masks, but come as a gel packaged in single-serve pods. The Orchid variety offers "anti-aging & smoothing" by way of hydrating skin (and in turn reduce the appearance of fine lines and other signs of aging.) While I can't speak to the anti-aging claims, this did a great job of hydrating and my skin looked more plump and brighter the next morning. 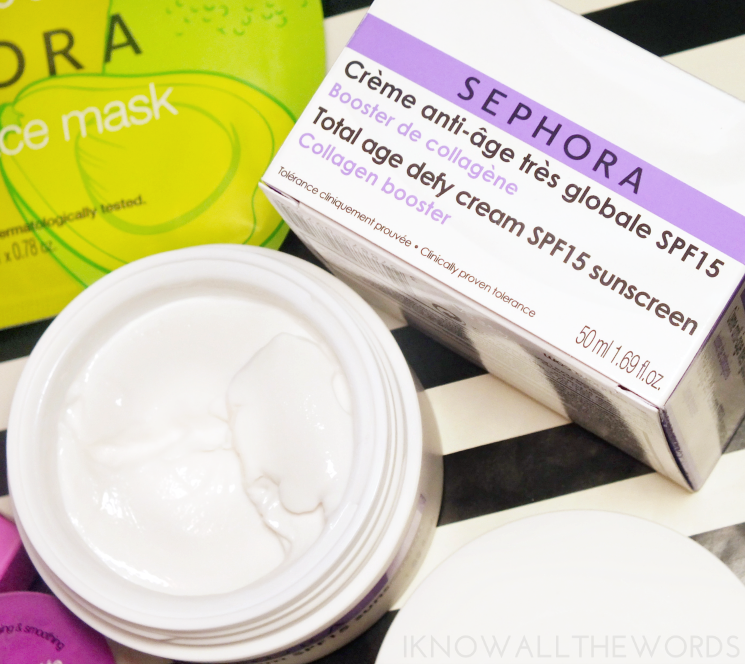 While we're talking anti-aging, the Sephora Collection also offers a SPF infused daily moisturizer in the form of the Total Age Defy Cream SPF 15. Granted, it's not a high level of protection, but decent for indoor day-to-day application. The thick and rich cream is intensely hydrating (but easily absorbed by skin)and formulated with lipoaminoacid which supports natural collagen, and light-reflecting pigments to give the appearance of brighter, more even skin. Once upon a time, I was blissfully unaware of puffy under eyes, but as I've aged, I started to notice little baby puffs appearing in the morning. Eww. While the aren't terrible, and do dissipate, I don't mind helping them off of my face a little quicker. The Kate Somerville Goat Milk De-Puffing Eye Balm has been the product that gets the job done. The balm has a light formula that glides invisibly on skin with a cooling, soothing feel that perks up sluggish and tired looking skin. The formula features goat’s milk, natural milk proteins, and manuka honey to hydrate and sooth the delicate skin around eyes. I really liked that this not only left my skin feeling super smooth and soft, but that it does seem to help banish bags. Another bonus, it can be applied throughout the day over makeup for on-the-go pick-me-ups. Okay, the next products is either going to make you say yay or nay. I don't think many will fall into the gray area with this one (although, I kind of do.) 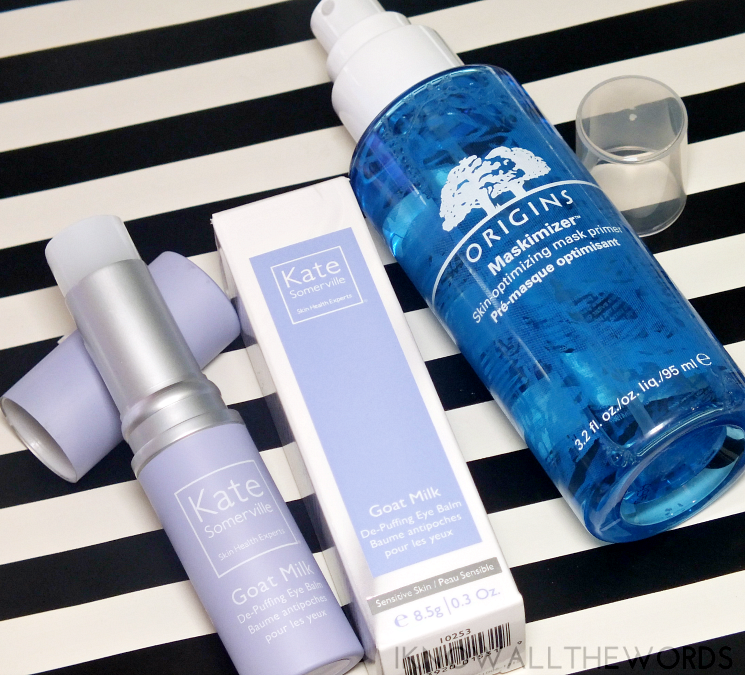 One of Origin's newest skincare innovations is their Maskimizer Skin-Optimizing Mask Primer. It's a lot of name for a pretty easy to figure out product- it's a primer that you spray on skin pre-mask application. It's supposed to optimize skin by way of "hydrating, soothing, and boosting skin's radiance immediately" and is also said to "improve spreadability and rinseability of masks" That second bit is kind of skincare mumbo-jumbo, but this does hydrate and sooth skin. I say you don't really need it as a mask primer (sorry, Origins) but it does make for a nice face mist pre-makeup application. Overall, some great skincare bits that just might need to be popped in your cart. What do you think? Could your skincare routine use any of these products? Tried any of them already?